Happy New Year! With this, as with so much else, I’m late – but the greeting is none the less sincere, and I’m grateful for your continued interest and engagement with my work. I’ve resolved to return to my usual pace of blogging in 2019; it slowed over the last several months, not least because I’ve been deep in the digital archives (apart from my merciless incarceration in Marking Hell and my release for Christmas). 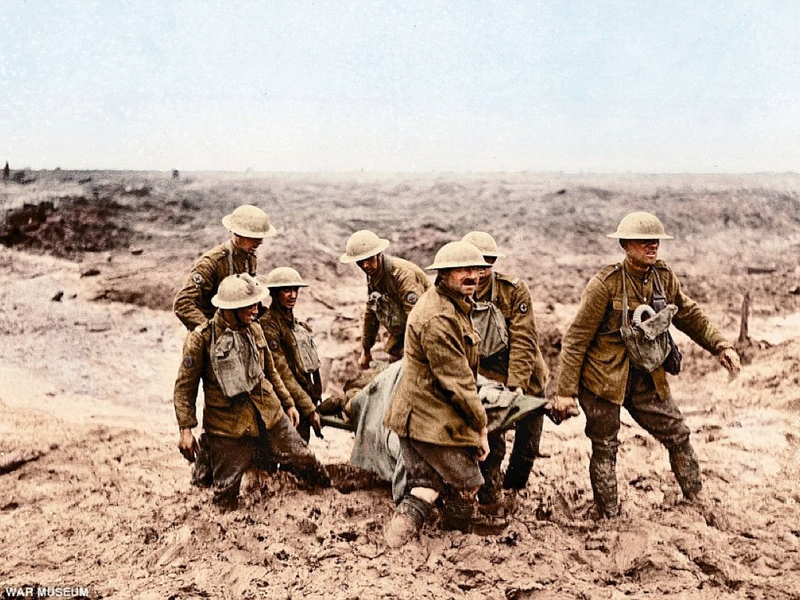 My plan is to finish two major essays in the next couple of months, one on “Woundscapes of the Western Front” and the other the long-form version of my Antipode Lecture on “Trauma Geographies” (see also here). 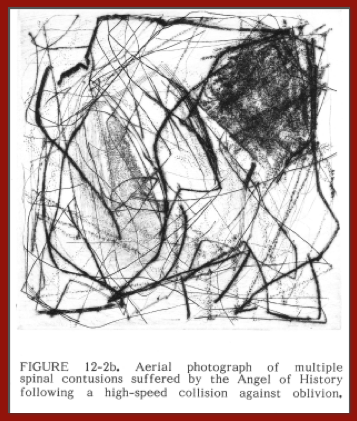 Both have involved close readings of multiple personal accounts of the journeys made (or not made) by the wounded, and the first essay informs the second, as you can see here. 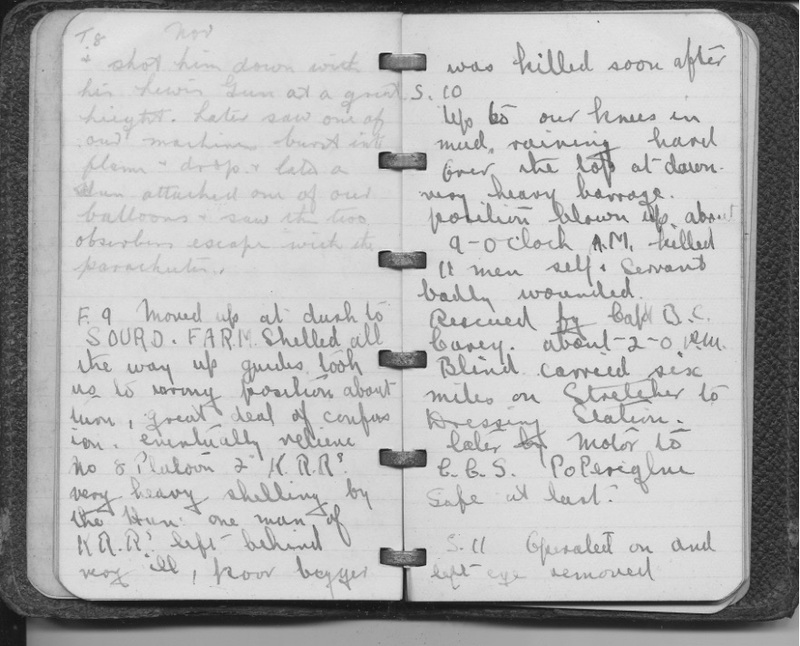 I also want to bring together my research on attacks on hospitals, casualty clearing stations and aid posts during the First World War in a third essay – I’ve been talking with the ICRC about this one. Paige Patchin managed to track down a series of files on the Etaples bombings in the National Archives for me, including an astonishing map plotting the paths of the enemy aircraft and the locations of the bombs: I’ll share that once I’ve managed to stitch together the multiple sheets. 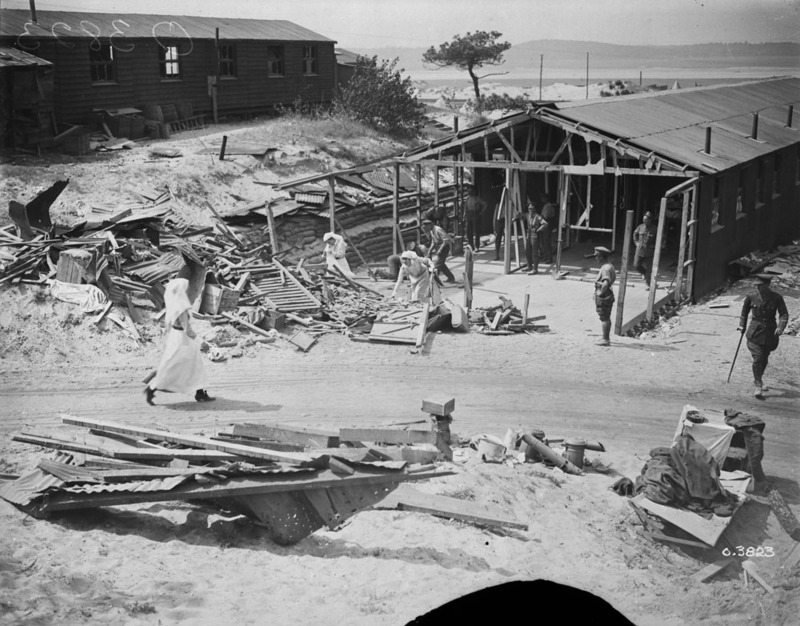 But I’ve widened the analysis beyond the attacks on base hospitals on the coast, to include other attacks – notably the bombing of the hospital at Vadelaincourt near Verdun – and a more general discussion of the protections afforded by the Red Cross flag and the Hague Conventions. 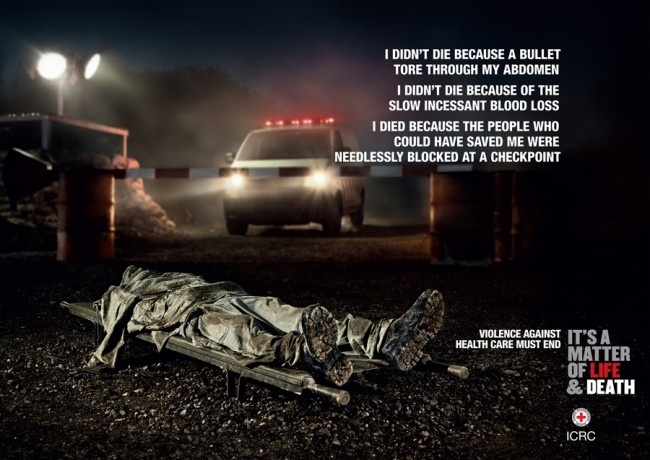 This will in turn thread its way into a fourth essay providing a more comprehensive view on violations of what I’ve called ‘the exception to the exception’: the disregard for the provisions of International Humanitarian Law evident in the attacks on hospitals and clinics in Afghanistan, Gaza, Syria and elsewhere, in short “The Death of the Clinic“. I think it’s a mistake to treat the space of the camp as closed (there is a profoundly important dispersal to the space of exception, evident in the case of Auschwitz that forms the heart of Agamben’s discussions – I’m thinking of the insidious restrictions on the movement of Jews in occupied Europe, the round-ups in Paris and other cities (see my lecture on Occupied Paris under the TEACHING tab), and the wretched train journeys across Europe to Poland – and this matters because if we don’t recognise the signs of exception at the peripheries they will inexorably be condensed inside the enclosure of the camp). 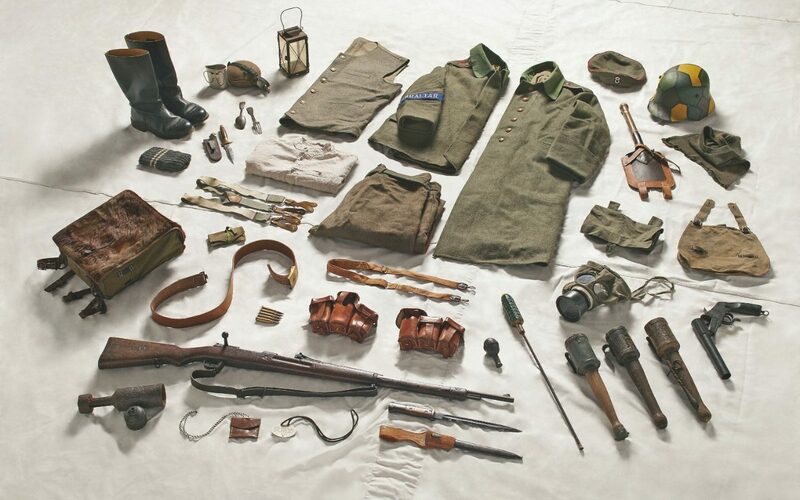 It’s also unduly limiting to restrict the space of exception to the camp, because the war zone is also one in which people are knowingly and deliberately exposed to death through the removal of legal protocols that would otherwise have offered them protection (and here too what Frédéric Mégret calls ‘the deconstruction of the battlefield‘ emphasises the complex topology of the exception). I’ve written about this in relation to the Federally Administered Tribal Areas of Pakistan (see “Dirty Dancing” under the DOWNLOADS tab) and the conduct of siege warfare in Syria (multiple posts, listed under the GUIDE tab), but it’s a general argument that I need to develop further). 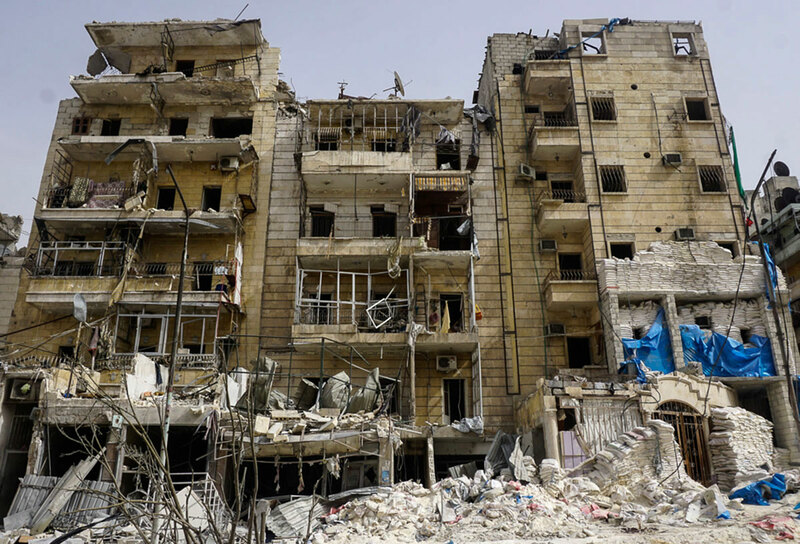 In neither case – camp or war zone – is there an absence of law; on the contrary, these spaces typically entail complex legal geographies, at once national and – never discussed by Agamben – international (though part of my argument addresses the highly selective enforcement of international humanitarian law and the comprehensive contemporary assault on its provisions by Russia and Syria and by the United States, Israel and the UK, amongst others). 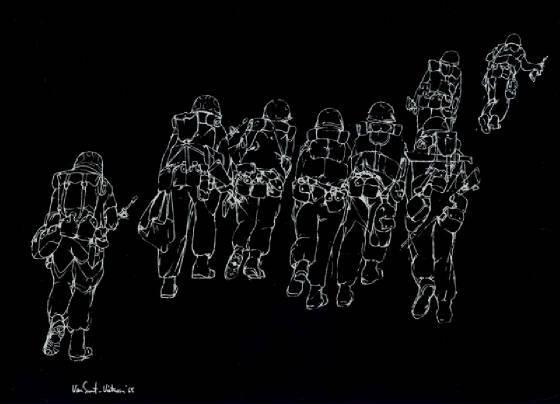 In both cases, too, the space of exception is profoundly racialised (I’ve written about that in relation to the bombing of Japan in World War II and the contemporary degradations inflicted on prisoners at Abu Ghraib and Guantanamo – you can find the relevant essays under the DOWNLOADS tab – but I’ve found Alexander Weheliye‘s Habeas Viscus: Racializing Assemblages, Biopolitics, and Black Feminist Theories of the Human immensely helpful in deepening and generalising the argument). I’ll be developing these arguments in my KISS Lecture at Canterbury in March, which ought to form the basis for a fifth essay (and it’s also high time I revisited what I said in “The everywhere war”!). More on those projects soon, all of which will feed in to two new books (once I’ve decided on a publisher – and a publisher has decided on me), but in the interim I’ll be sharing some of the drafts and jottings I’ve prepared en route to the finished essays. So lots to keep my busy, and I hope you’ll continue to watch this space – and, as always, I welcome comments and suggestions. My Antipode Lecture on Trauma Geographies is now available online via YouTube. (If you wonder why I’m hunched over my laptop, the microphone was fixed to the podium….). Since I’m now turning this into an essay, I’d welcome any questions, comments or suggestions. You can find more details including open access to a series of related articles – at the Antipode Foundation website here. I returned from the RGS/IBG Conference in Cardiff to the start of term (which explains and I hope excuses my silence: I’ve updated my two course outlines for this term, and you can find them under the TEACHING Tab if you are interested; if you have any comments or suggestions I’d be happy to have them). 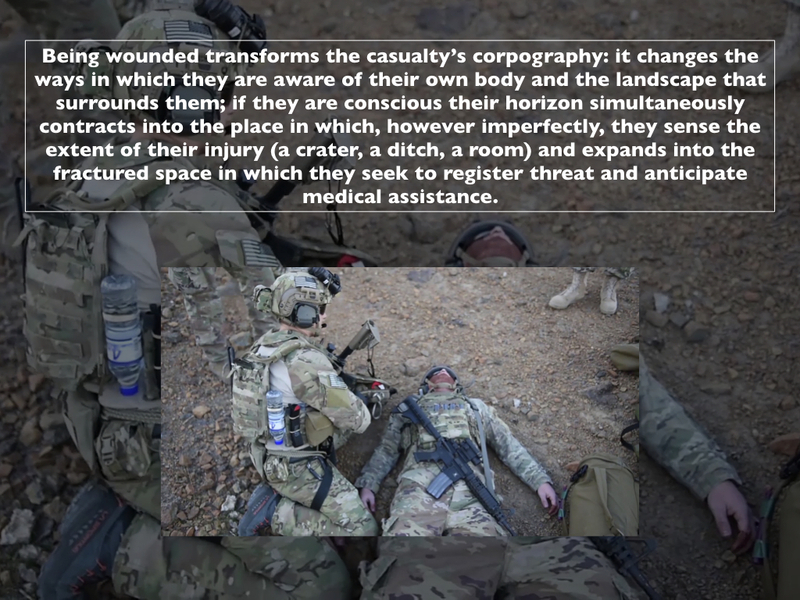 My next order of business is to turn my Antipode Lecture on “Trauma Geographies” into a text (the video will be online soon, I hope); I’ve already started on the translation, helped by questions and feedback from the presentation, and I’ll post the draft when it’s ready. 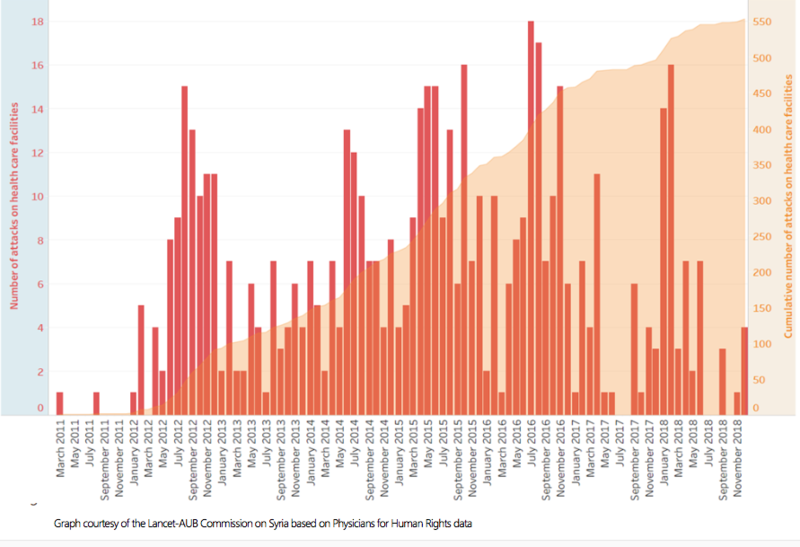 The argument moves from medical care and casualty evacuation in Belgium and France, 1914-1918 through Afghanistan 2001-2018 to Syria 2011-2018, and in each case I address both combatants and civilians. 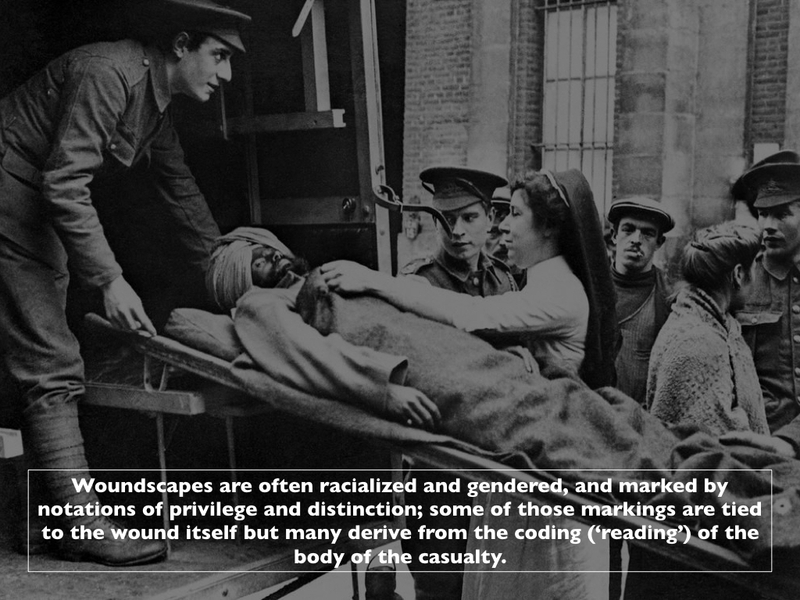 Much of this trades on (and develops) posts that will be familiar to regular readers – and if you’re not the GUIDE tab ought to help direct you to the most relevant ones – but I’ve also returned to my ideas about corpography and used them to flesh out (sic) the concept of a ‘woundscape‘. 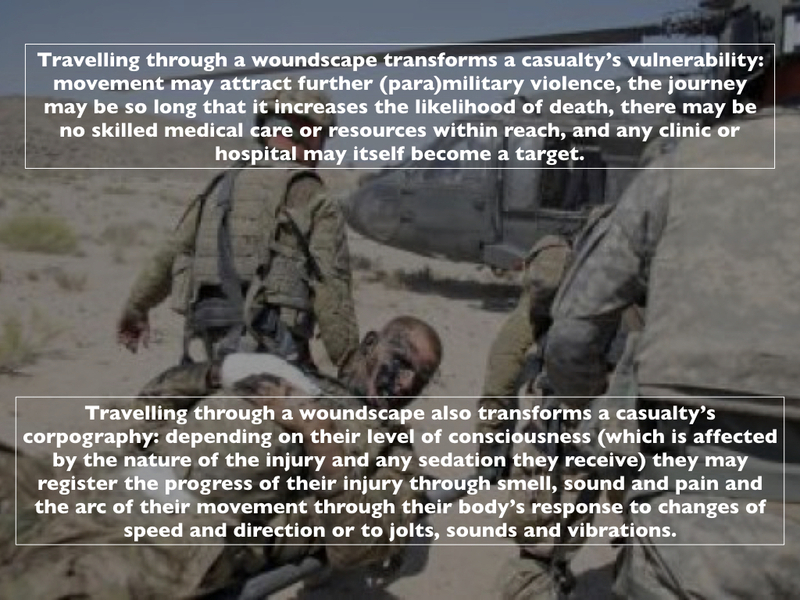 I decided to that because one of the themes of the conference was landscape, and the idea of a woundscape seemed to take that debate in a fruitful new direction. 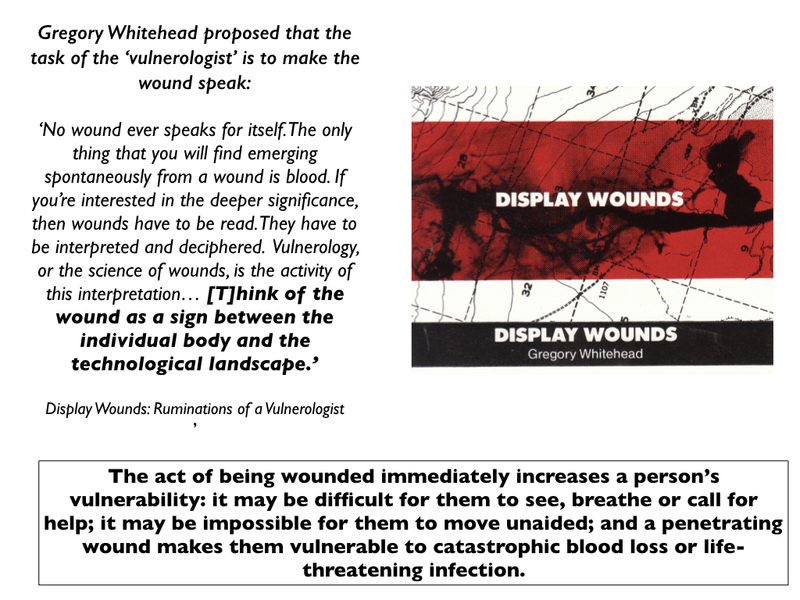 I first encountered it in Jennifer Terry‘s brilliant Attachments to War, and she in turn found it in the work of Gregory Whitehead (particularly Display Wounds). A common thread runs through the articles of this issue of MAT: the conjoining of clinic and crisis. Here we refer, in the manner of Foucault (1963) to the clinic as both an epistemology (a way of knowing) as well as a material space where the ill seek care. 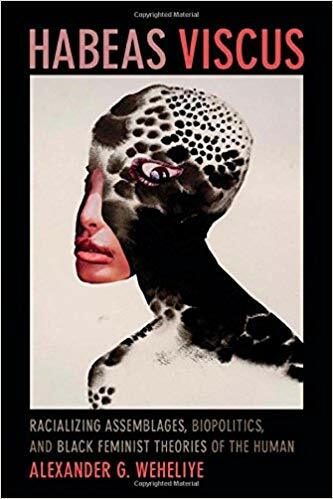 Crises are moments of rupture, where the surface of everyday life splinters to reveal what lies underneath and new dangers can appear; they are also turning points where futures can be grasped and foretold. Moments of social crisis manifest in bodies, and therefore in the clinic. Das’s notion of ‘critical events’, as discussed in Affliction: Health, Disease, and Poverty and also taken up in MAT’s September 2017 issue, furnishes perhaps the most thorough consideration of crisis. As she and others have pointed out, crisis is an everyday reality for many who live in conditions of precarity and existential instability. More generally, the current geopolitical climate and the growing urgency of climate change contribute to the sense of crisis. The clinic is symptomatic of crisis, a place where a state of emergency becomes finally visible. 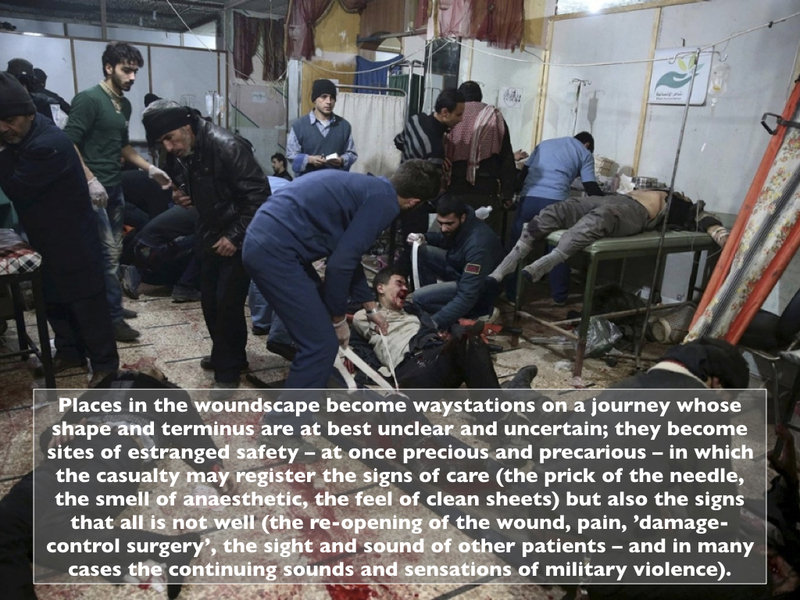 More soon – and I haven’t forgotten that I need to return to my series of posts on Ghouta and, in particular, to address the issue of medical care and casualty evacuation (or lack of it) there too. Theory of the drone 12: 'Killing well'?